1.Thyroid Imbalance– Low thyroid and autoimmune thyroid (Grave’s disease and Hashimoto’s) are common culprits for a thinning scalp. Often times these conditions go undetected because there has not been a thorough work-up for thyroid imbalance. Lab tests to request your doctor order: TSH, Free T3, Free T4 and Thyroid Antibodies (TPO Abs and TG Abs). Here are six common factors that are destroying your thyroid. 2. Nutrient Deficiencies– The most common nutrient deficiency that causes hair loss is iron. You may not be full-blown anemic, but your iron stores (ferritin) may be low. Your hair follicles actually store ferritin. When your body is short on iron for its essential functions (such as red blood cell production), it will steal it from the ferritin stored in less essential parts of the body, such as the hair follicle. This then results in hair loss. The conventional range for ferritin is 10-120, but for optimal health (ie. good energy, good mood and full hair) the goal for ferritin is 50-70 in women. Other vitamins play a key role in hair growth too, such as Biotin, B12, vitamin A, vitamin E and vitamin C. Sometimes it is as simple as taking an Iron or B vitamin supplement to replenish stores, but often times we need to heal your gut so you can properly absorb these nutrients. 3. Changes in Estrogen- During pregnancy, estrogen levels peak and then dip, causing sudden hair loss for many women. In addition, many women are in a state of estrogen dominance for most of their life. 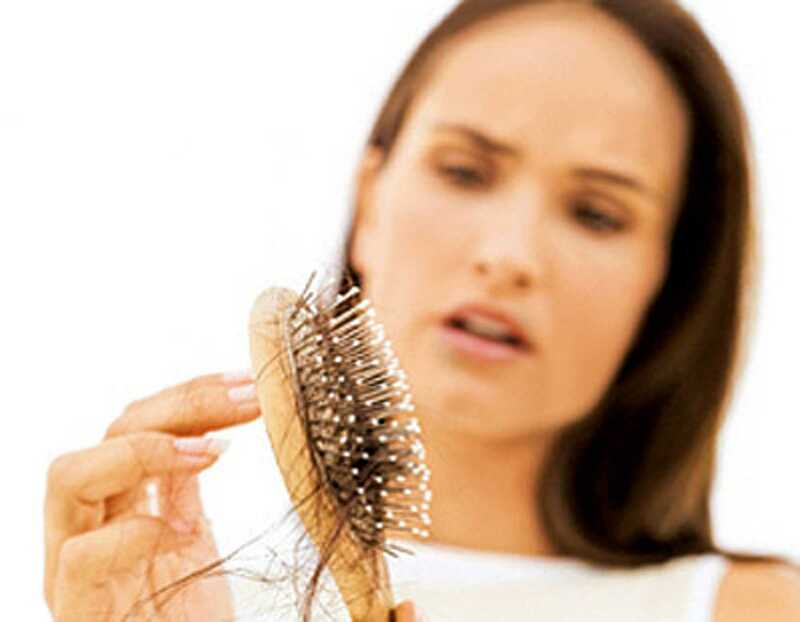 Excess estrogen can cause thinning hair. And then during the perimenopausal state, estrogen levels can plummet triggering worsening hair loss, mood changes, insomnia, hot flashes, night sweats and low libido. 4. Adrenal Fatigue- Chronic stress takes a toll on the body, resulting in low mood, low libido, hair loss and fatigue. Your body is wise and when it is under stress, it redirects energy used for noncritical processes (ie. hair growth) to more critical physiological processes to keep you alive. The solution is to get you out of that “survival mode” by nurturing your adrenal glands. A salivary cortisol test can give us more insight as to the health of your adrenal glands and thus the potential underlying cause of your hair loss. 5. Excess Testosterone- Elevated testosterone in women can cause male pattern hair growth (beard!! ), acne, and a thinning scalp. Women with PCOS (Polycystic ovarian syndrome) often have elevated testosterone, resulting in irregular cycles, male pattern hair growth, thinning scalp, acne and weight loss resistance. Get your testosterone and DHEA levels checked to be sure this is not the underlying cause of your thinning scalp. Unfortunately, there is no magic, easy cure to hair loss. It can take time to get these hormones balanced and vitamins replenished. Be sure that any of your medications don’t have a side effect of hair loss. Stress management is key! Eating a diet rich in fat (avocados, eggs, nuts, seeds), taking bioavailable vitamins and minerals, and eliminating food sensitivities are important as well. If you are having hair loss, this is a sign that something is off balance. Find an ND that will listen to your WHOLE story and help you identify these causal factors and then address them accordingly. Be well!